When compared to the history of humankind, let alone that of the Earth, the inquiry into the development, roots and relations of humans is very young indeed. Up until the 18th century, the biblical story of human creation�"So God created man in his own image, in the image of God he created him; male and female he created them. "�was accepted as an incontestable truth in many parts of the world. Then, however, natural scientists� Charles Darwin the most celebrated among them�appeared. They doubted the special status attributed to humans by the Bible and viewed their development within the context of a theory of evolution. The theory has since been supported and modified by the discovery of skeletal remains, primitive tools, and the remnants of ancient settlements. Their classification, dating, and evaluation using modern technologies has made possible an increasingly accurate perception of human origins. Reconstruction of a hunting scene from the Old Stone Age, ca. 25,000-30,000 B.C. 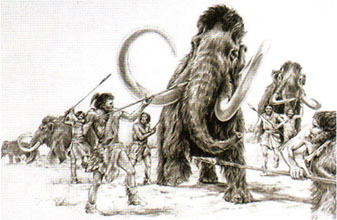 For the Cro-Magnon man, the mammoth was a desirable prey as use could be made of the meat, hide, and teeth. From the Beginnings to ca. 4000 B.C. Even today, no definitive answers to the questions about the origins of mankind have been found. In 1871, Charles Darwin challenged the answers given by the biblical story of creation with his theory of evolution. The evolution theory suggested that man had 1 descended from anthropoids. Africa, site of the earliest hominoid discoveries, is considered to be "the cradle of mankind." The evolution of today's Homo sapiens can be traced by the trail of skeletal remains, tools, and the remnants of settlements�such as cave paintings�that have been left throughout the ages. hominoid finds since the mid-19th century, the hypothesis of an African origin for humans is generally accepted today. 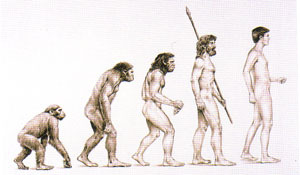 The 2 story of man's origins and evolution was the subject of fierce controversy throughout the 19th century. 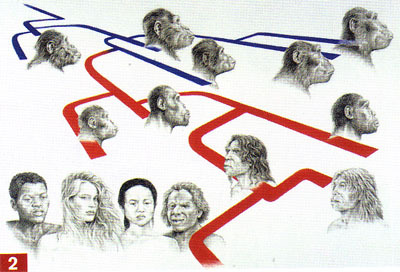 2 Evolution from Australopithecus anamensis (blue) to Homo habilis, Homo rudolfensis, Homo erectus and archaic Homo sapiens to Homo neanderthalensis and Homo sapiens sapiens. "De dissectione partium corporis humani libri tres"
Early or Lower Paleolithic: ca. 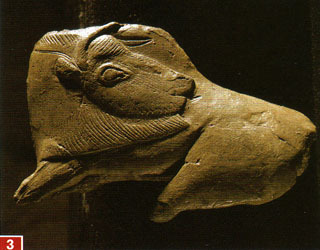 2.5 miIlion-250,000 B.C. 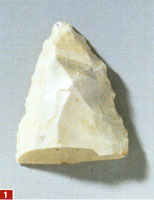 Middle Paleolithic: ca. 250,000-30,000 ex. Late or Upper Paleolithic: ca. 30,000-10,000 B.C. Neolithic Period: ca. 10,000/8000-4000/1800 B.C. Iron Age: from ca. 1100/800 B.C. Early Pleistocene: ca. 1.8 million-800,000 B.C. Middle Pleistocene: ca. 800,000-127,000 B.C. Late Pleistocene: ca. 127,000-10,000 B.C. There were two schools of thought. According to the creationist doctrine of the monotheistic religions, man had been created by God, after which he did not evolve. In opposition to this stood Charles Darwin's theory of evolution, which stated that life was 3, 4, 5, 6 continually evolving and emphasized the connection between human origins and the animal kingdom, specifically primates. Darwin's theory proposed a progressive refining of the intellectual, social, and creative abilities of early man. 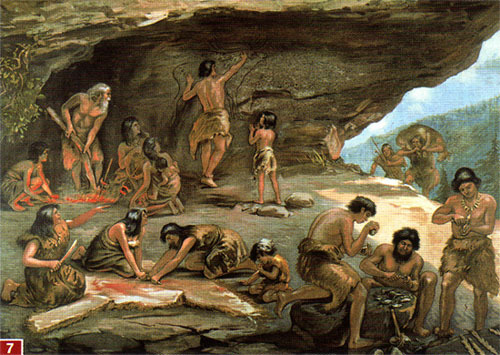 He illustrated this theory with reference to the increasing use of tools and man's lifestyle shift from hunter-gatherer to farmer and animal breeder. Simultaneously the 19th century saw the beginning of a systematic notation and classification of hominoid fossils and stone tools. Of particular concern was the determination of the age of the fossils; however, accurately dating the finds only became reliable with the discovery of the radiocarbon dating method in 1947 by Professor Willard F. Libby of the University of Chicago. As the oldest hominoids were found in East Africa, a theory proposing Africa as the "cradle of mankind" emerged. This hypothesis was substantiated by the discovery of the "Taung Baby." a 2.2-million-year-old Australopithecus africanus in 1924. 6 Homo erectus (ca. 1.9 million� 200,000 B.C. 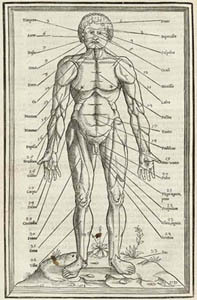 ), reconstructions. According to the most recent discoveries, man's beginnings can be traced back more than six million years. Through a succession of progressive stages, the earliest hominoids developed increasingly greater skills. Slowly man began to leave his African "cradle." Following Darwin's theory, paleontologists looked for a "missing link" between man and his nearest relative in the animal world, the chimpanzee. Since then, many hominoid species have been discovered, not all of which are direct ancestors of the modern Homo sapiens. For a long time, the Ardipithecus ramidus, which lived 5.5�4 million years ago in present-day Ethiopia, was considered the earliest hominoid. In 2000, however, Orrorin tugenensis ("millennium man") was found. It lived about six million years ago in Kenya. 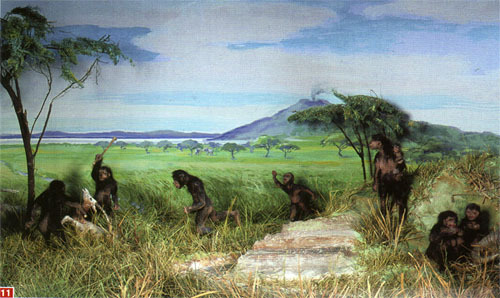 The next stage after the Ardipithecus was the 7, 8 Australopithecus, which lived 3.7-1.3 million years ago and was already using primitive pebble tools. The Australopithecus afarensis became famous through "Lucy," whose skeletal remains were found in 1974. The next stage of development was the Homo genus. Homo habilis, which lived 1.5-2.3 million vears ago, had a larger brain and ate a broader diet than did previous hominoids. The new diet included meat and animal fats� until then the hominoid diet had been purely vegetarian. 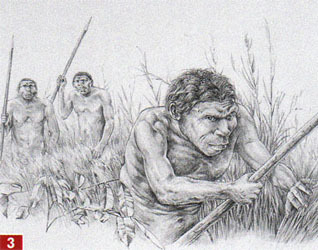 Homo habilis was the first hominoid to leave the forest and 11 hunt in the savannas. He is credited with the earliest hewn stone tools, which were probably used to break open bones to get at the marrow. Homo ergaster (Homo erectus), which lived approximately 1.8-1 million B.C., settled throughout the African continent and was the first hominoid that resembled modern man in size and proportions. He walked erect only, stored food supplies, and made stone artifacts. About 1.6 million years ago, he made the first completely reworked 9, 10 hand axe that also functioned as a pick. Homo ergastcr was also the first hominid to travel beyond Africa, gradually populating the nearer parts of Asia and Europe. No hominoid discovery has elicited such a sensation as the almost complete, 43-inch-high skeleton of a female Australopithecus afarensis found in the Afar region of northeastern Ethiopia in 1974. She was named "Lucy" after a Beatles song that had been playing in the research camp. The press promptly named her the "missing link." She belongs to man's plniogenetic line and possesses all the anatomical prerequisites for walking erect. Her bones and teeth provided valuable information about her lifestyle. Spreading out of Africa, early man initially settled in Asia and Europe, and then in Australia and the Americas. Cro-Magnon man�who were able to establish themselves in Europe. 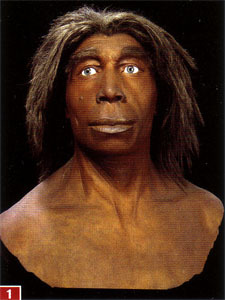 It was long believed that early man did not leave his African homeland until ca. 1.4 million years ago. 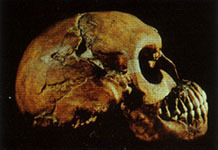 However, in the 1990s, a 1.7-1.8 million-year-old hominoid skull was found in Georgia in western Asia. The oldest Homo erectus fossils have been found in Asia; "Java man," named after the island where the first example was discovered, is today dated to 1.7 million years B.C., while 2 "Peking man," found in China, is dated to 600,000-200,000 B.C. By that time, Homo erectus was probably already using fire and possibly a form of human speech. Homo erectus was also the first hominid to live in Europe, which was at that time characterized by extreme ice ages. The European form of Homo erectus is named 3 Homo heidelbergensis after a find near Heidelberg in 1907. They are thought to have lived 400,000-800,000 years ago. 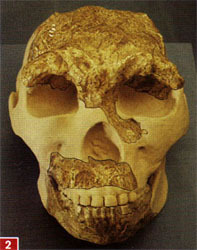 2 Skull of "Peking man,"
The Late Pleistocene era (127,000-10,000 B.C.) was the age of the Neanderthal. This new hominid, considered to be cither a side branch of Homo sapiens or a separate subspecies, came about through a series of evolutionary stages and died out about 30,000 years ago. Since the first finding of a Neanderthal skullcap in 1856, this has become the best known example of primitive man. 1, 4 Neanderthals were stocky Ice Age hunters with the greatest skull volume of all hominoids known to date. Their wide nose and large nasal cavity were well suited to the cold climate. Around 40,000 years ago, modern Homo sapiens, in the form of the Cro-Magnon man, finally migrated out of Africa to Europe. This direct ancestor of today's man inhabited modern-day Israel as early as 100,000 �.�. ("Proto-Cro-Magnon"). They were taller, more slender and had more stamina than the Neanderthals, but the two coexisted in parallel in Europe for about 10,000 years. Many theories concerning their coexistence and the causes of the Neanderthal's displacement have been suggested. It is generally assumed that there was interaction and a mutual influence between the two hominid genera, but interbreeding of the two is considered highly unlikely. At least 60,000 years ago, although possibly much earlier, early man settled the Australian subcontinent by way of New Guinea. The first hominids did not reach the Americas, however, until just 11,500 years ago. Ice Age hunters came to the continent via Siberia and Alaska. The oldest finds discovered in America arc worked stone arrowheads and spear points. These, known as "Clovis points." are thought to stem from the Clovis culture. Following the classification in 1863 of a partial skull found in a cave in the Xeander Valley near Dusseldorf in 1856, one of man's early relatives became known as the Seanderthal. 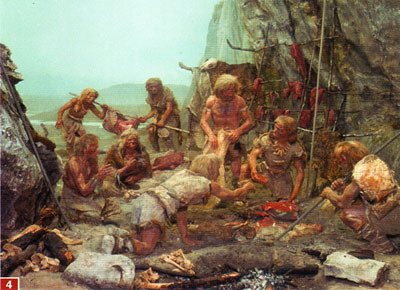 Researchers later determined that previouslv unclassifiable bones discovered in Engis, Belgium, in 1829-1830 and again at Kalpe (Gibraltar) in 1848 belonged to this hominid. The Kalpe skull is much better preserved than the skullcap that was finally identified, and the Neanderthal should perhaps have been named the "Kalpe." The extent of man's development can be gauged by the tools and hunting weapons he used. larger groups in increasingly permanent shelter. 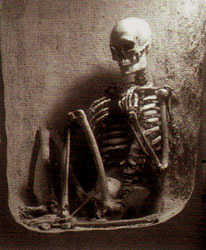 Alongside skeletal remains, stone artifacts are the best preserved witnesses of the early period of man's existence. The hominids of the Lower Paleolithic made use of materials readily available to them. 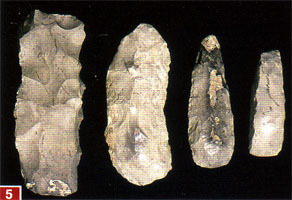 The first 6 stone tools were fashioned by striking one stone with another or with a stick to chip flakes off it, shaping the stone into a tool such as a 5 hand axe. Alternatively, flakes were used to scrape or 8 chisel the stone into shape. In the Middle Paleolithic, the demands of the hunt necessitated improvements in hand weapons and precisely worked blade points. 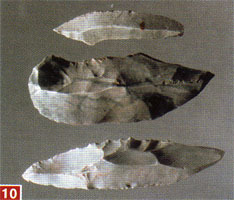 This resulted in the "thin blade technology"�long, narrow blades of stone or horn used as spear points or harpoons. Early man used caves for shelter, though possibly not before the discovery of fire in the Lower Paleolithic period, as the caves were often inhabited by cave bears and wild cats. Initially the caves were probably used only in the cold seasons, but some 7, 9 larger caves might have been lived i n year-round as early as the end of the Lower Paleolithic period. During the Paleolithic, early people first made their homes in the open�often near rivers or lakes�where they probably built mud huts with leaf roofs. Later dwellings were dug out of the ground. Tent-like constructions made with skins stretched over wooden posts or mammoth tusks began to appear during the Upper Paleolithic period. The dwelling sites of the groups probably changed with the seasons as the groups migrated, but there were also long-term habitation sites such as that uncovered at Willendorf, Austria. The living area was lined with stone slabs and animal skins. Evidence of houses and permanent settlements first appears during the Neolithic period. Among the finds associated with Cro-Magnon man are elaborately decorated bone or horn staffs. All of them are pierced. They were first assumed to be cult status symbols and described as "staffs of office." 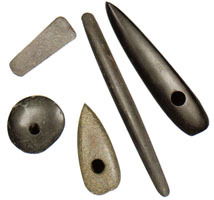 Now it is accepted that they were implements for straightening the stone or bone points set in spear shafts. Cro-Magnons also used spear throwers or at-latls�staffs with a hook on one end; spears were placed against the hook. These increased throwing distance and striking force of the spears. it required an evolution of man's social abilities to enable coordination within an effective hunting group. With the taming of fire, man learned to harness a force of nature. This and associated social changes are considered to be decisive in the development of modern man. The earliest hominoids were probably vegetarians who gathered plants and fruits and unearthed roots and tubers with digging instruments. The expansion of the diet to include meat, which accompanied the move to hunting�although the early 4 hunters were definitely scavengers as well�was paralleled by a huge development in social intelligence. The hunt required collective effort, skill, strategy, and caution. It required communication within a group and possibly the definition of territories through agreements with other groups. One hunting strategy used by early man was the battue, in which the animals were driven into ravines or off cliffs. The essential knowledge of the 3 prey and its habits also undoubtedly led to the early hunters' first awareness of their superiority over the other animals. The most important 2 weapon in the Lower and Middle Paleolithic was the pointed wooden spear or lance, which initially was thrust and later thrown. The bow and arrow did not appear until the Neolithic period. Shortly afterward the dog was domesticated to assist in the hunt. The preferred prey was the aurochs (or wisent) and red deer in Europe, reindeer and moose in the northern lands, and antelope in Africa. 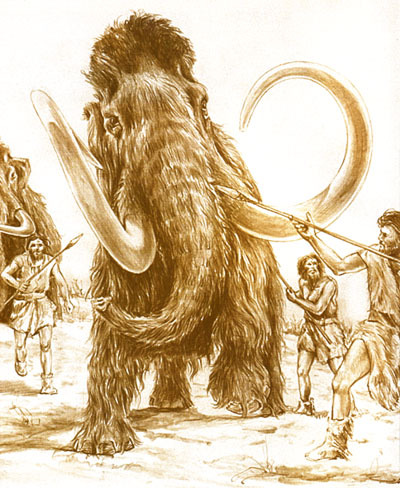 Early man also hunted pachyderms such as the mammoth, forest elephant, and woolly rhinoceros. 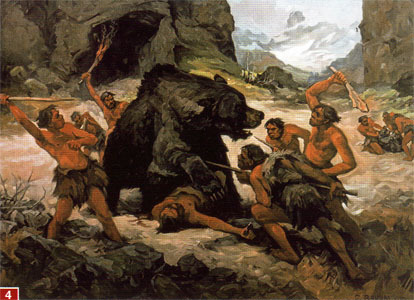 Cave bears, which played a special role in their cults, were also hunted. These animals became extinct during the transition to the Neolithic period. The use of fire, verifiable in numerous places as early as the Lower Paleolithic, is seen by many researchers as the truly decisive step in the evolution of modern man. At first, early man probably made use of prairie fire and fire resulting from lighting, until he learned how to create it with 1 flint stone and control it himself. Thus, he took control of a force of nature for his own protection and as a weapon. He also used it for cooking and roasting his food. Furthermore, it was probably the discovery of fire that made it possible for him to use caves as dwelling places. Many theories about the division of labor between the sexes during this stage of human evolution have been proposed. Theories have suggested that this may have been the point at which the distinction between the male as hunter, and the female as gatherer and custodian of the fire and children, was first made. The use of wooden spears for hunting is evidenced by the many animal skeletons that have been found pierced by lances and spears. Near Hannover, Germany, for example, 400,000-year-old horse skeletons were found with three-foot-long lances embedded in their sides. 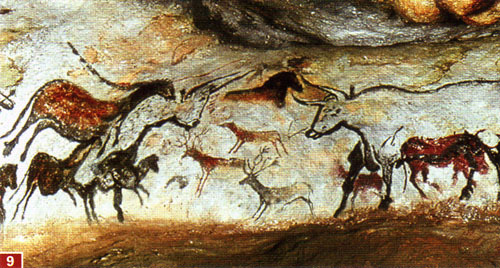 Hunting scenes showing animals shot with spears and arrows are popular subjects of cave paintings. In the wisent hunt in Europe and the bison hunt in prehistoric America, individual animals would be isolated and then hunted. Nets into which animals were driven were also used in the battue for wild horses, red deer, and reindeer. Mankind's progress also involved the evolution of mental and intellectual abilities. early death cults, are considered milestones in this respect. A "psychological revolution" took place hand in hand with the technical and social development of early man. The formation of social groups made it necessary for individuals to express their conscious concerns and feelings as well as to recognize differences. It is assumed that a basic awareness of the self and others and a capacity for simple speech were present from Homo ergaster onward. Language serves as a way of transmitting thoughts, using sounds and words to denote meanings (ideas). Thus, language would have required an ability to conceptualize the ideas communicated through words and symbols. Symbols arc characters that�unlike pictographs�do not need to resemble the things they symbolize. These symbols are associated with certain agreed-upon (conventional) meanings, which are then learned by the members of the group. The use of language therefore implies the parallel development of all these faculties between themselves and others. However, due to the lack of written evidence, only indirect conclusions as to the exact nature and extent of this development are possible. A higher degree of intellectual abstraction was also a prerequisite for the burial of the dead by early man. With knowledge of the burial rites comes the supposition of an awareness of the mortality of man. protect the dead or to protect the living from the spirits of the dead. 10 Special treatment of the skull has been noted almost everywhere, often with the brain having been removed through holes bored in the rear of the skull. In Upper Paleolithic times, the bodies of the dead and especially the skulls were generally sprinkled with ocher, a red pigment, and buried in separate stone encasements. Precious 9 jewelry and finely worked, unused 11 stone implements have been found as burial objects inside the skeletons. Teeth with holes bored into them have also been found inside the graves and were probably worn as pendants. During the Upper Paleolithic, the dead were buried in graves dug especially for this purpose. These were often in the middle of the dwelling area or near a fire site. Presumably the dead were buried there only after the group had moved on. The circular holes in the back of many skulls are a greater riddle. Probably the brains of the deceased were removed through these holes. However, some skulls have been found in which the cranial bones had partially healed or grown back at the edges, suggesting that the person lived for some time after "trepanation" was performed. A series of prehistoric finds indicates the existence of ritual cults and sacrificial ceremonies. Opinions diverge widely as to whether a form of religion had already developed. hunting mysticism, and the preparation of food. Among the indications of man's psychological evolution, a fundamental one is the emergence of the belief in a transcendental power to whom sacrifices must be made. Another is the consciousness of a special relationship between man and animal, hunter and prey (animalism), and man and his environment. It is widely accepted that the earliest "religions" or cults were associated with hunting. One of the oldest cult rituals, evidenced since the end of the Lower Paleolithic period, was the ceremonial sacrifice of animals. Examples of this include female reindeer that were submerged in lakes and moors with stones and wooden stakes in their open breast cavities. The buried skeletal remains of animals, especially mammoths, draped with jewelry have also been unearthed. The cave dwellers of the Middle Paleolithic decorated and reworked the skulls of cave bears and buried them or stood them up behind stone walls. This practice has led to the supposition that a particular cave bear cult existed. Parallel to the shaman concepts of Siberian hunting tribes, some researchers interpret the decoration and special treatment of animal bones as either a "compensation ritual" for the killing of the animal or an expression of early man's belief that through the burial, the prey would "arise anew." Others theorize that the early humans were sacrificing a portion of the kill to a hunting god or animal totem. 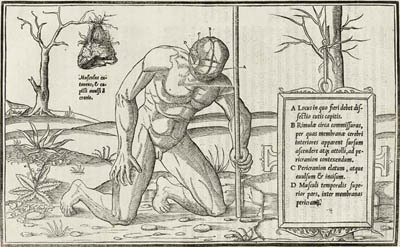 Related to this are the representations of half-human creatures, such as the "Sorcerer of 1, 4 Trois-Freres," which have been the subject of particularly controversial interpretations. Cult rituals may also have developed around the dividing up of the kill among the group and the preparation of food around the hearth. 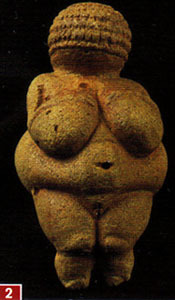 Possible evidence of this are the many 2, 3 female statuettes with voluptuous forms that have been found around hearths dating back to the Upper Paleolithic. These probably symbolize either fertility or a mother deity. Another controversial subject is the religious or cult interpretation of the art of early man. The representations of game and hunting themes found in cave paintings may have been intended to invoke success in the hunt or protection against dangerous game. No cave painting has provoked as many different attempts at interpretation as the famous "Sorcerer of Trois-Freres." The name itself is rejected by many researchers. The sorcerer is one of three hybrid creatures discovered on a cave wall in 1916. The painting depicts all three creatures with animal heads and front limbs. The rear part of the body, however, is human. 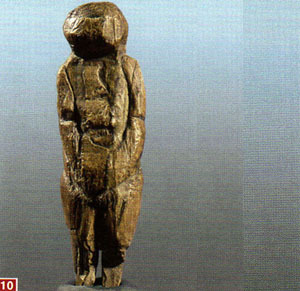 Some researchers, referring to shaman practices in other cultures, see this figure as a "medicine man" dressed in animal skins and an animal mask. They suggest he might be performing a mystical hunting dance as a supplication for the successful outcome of the hunt. Other researchers doubt this theory and see him simply as an imaginative cross between man and animal which testifies to the creativity of early man. cave painting, ca. 14,000 a.c. The best known examples of the diverse and impressive artwork of early man are cave paintings. Predominant motifs include game animals and representations of people. are diverse in style and allow for a variety of interpretations. 5 Cave paintings and 9 wall engravings first appeared during the Upper Paleolithic period. The caves of France and northern Spain are particularly rich in art. For a long time, it was believed that motivation for these artworks originated from observation of the cracks and fissures on cave walls, which inspired early man to create first geometric designs and then drawings. 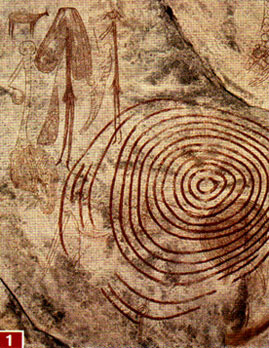 However, the painted looping lines have been shown to be no older than the developed picture motifs. Thus from the start the artists must have been aware of the possibility of representing their environment in images. Generally, it is assumed that the cave paintings did not primarily serve an aesthetic purpose, nor were they the work of one gifted individual but rather represented the world of the group. 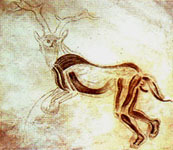 The dominant theme of the cave paintings is game animals, all depicted in profile and in motion. The rare human figures appear abstract by comparison. The figures are always standing alone and are not uniform in style. Realistic pictographic representations can be seen alongside stark abstractions of human and animal images with overly emphasized details. Another special subject in the caves is the 8 human handprint. Even more numerous than the paintings are the cave and rock engravings that occasionally overlap and portray themes similar to the paintings. Engravings are also found on stone, antler horn, and animal bone. 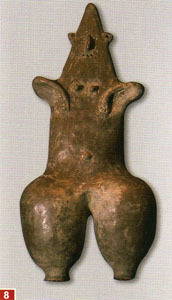 In addition to paintings, sculptured pieces were also produced in the Upper Paleolithic. Many 6, 7 small sculptures made of limestone, soapstone, bone, and antler horn�as well as baked-clay figurines�have been found. The smaller ones were probably worn as pendants. 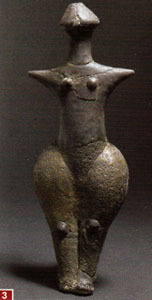 The statuettes most often depict 10 females and are considered to have been fertility symbols. The figures vary from coarse cone shapes to ones with well-detailed facial features. 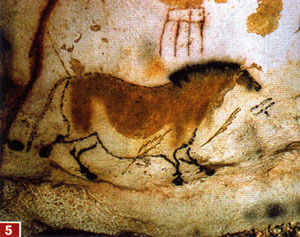 Upper Paleolithic cave paintings can be found in Western Europe, particularly in France and Spain, the Urals, and Siberia. 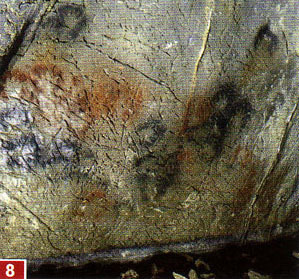 Cave artists used various iron ochers dissolved in water for coloration. 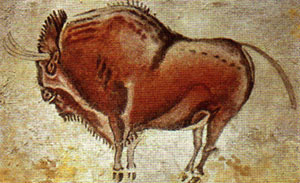 Egg whites, fat, plant juice, and blood created shades from red to yellow and brown (visible in paintings of the wisent of Altamira, Spain, for example) were used in the paintings. Black tones were achieved with animal charcoal or manganese. Handprints in the caves usually appear in black or red. In some cases, the artist's hand was painted with a liquid color and then pressed against the cave wall (a positive print); in others, the hand was placed on the wall and paint was sprayed around it so that when the hand was removed a negative handprint remained. primarily due to the introduction of agriculture and animal domestication. of the modern form of settlement. The Neolithic period saw a rapid development in many aspects of human culture, characterized by 5 man's attempts to establish independence from the vagaries of the environment in which he lived. This process was made possible primarily by the broadening of the diet, which was linked to agriculture and the domestication of animals and occurred as a result of sedentary life in 3, 4 houses and communities. The hunt continued to play a role in providing nutrition, yet the supply of food was no longer completely dependent on the success of the hunt as there were now alternative food sources. There was a parallel technological revolution. The introduction of fired 1, 2 ceramic vessels, initially used for storing food supplies, defined whole cultural communities, such as the Middle European "Linear Ceramic Culture." Advances also included the use of rotating grindstones and mortars for the processing of plants for food and the construction of houses from clay bricks. Wood was worked at first with chisels and stone axes. Sickle tools were used to cut grasses and grains. 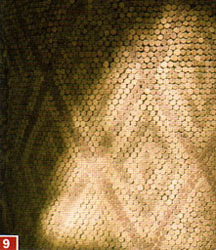 After 3000 B.C., metallurgy (initially with copper), using simple pouring techniques, appeared in the Near East. Agriculture demanded long-term planning as well as knowledge of climatic periods and seasonal cycles. The cultivation of fertile alluvial land began, particularly in Mesopotamia and along the Nile. Goats, sheep, pigs, and later cattle were domesticated for man's use. New cults also formed around plants and grains. Many Neolithic houses had their own cult niche where offerings such as grain, fruits, and animal remains have been found. The surviving clay, stone, and metal statuettes are thought to be votive offerings, as many have raised arms or open hands in an attitude of supplication. Some represent God. Most Neolithic settlements had separate cult edifices. 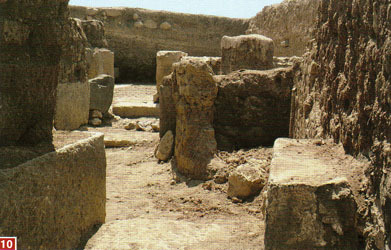 In the Near East, there were early temple complexes. The transition to advanced civilizations began even before 3000 B.C. in these regions with the development of script or hieroglyphics and of religious monarchies. The oldest culture of the Paleolithic period in Central and Southern Europe is known as the Linear Ceramic Culture. It stretched from eastern France to Hungary in the fifth millenium B.C. The people lived in closed settlements with nave houses and pursued agriculture and animal husbandry. The culture was named after the ribbon-like decorations typically used on their pottery. These decorations were made up of solid lines and dashes. The Linear Ceramic Culture tribes buried their dead positioned toward the sun, on their side, and with legs drawn up in a sleep-like pose. Some researchers infer from this that they had the concept of an afterlife. Skeletal remains have also been found in a supine position with outstretched arms, reminiscent of certain types of statuettes. Modern village and city cultures developed from the Tell (Arabic for "hill") settlements of the Near East. These give evidence of a social differentiation between the inhabitants as well as an organized economic life. demonstrate a fluid transition to early advanced civilizations. 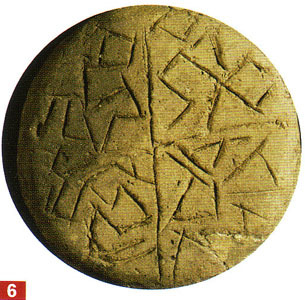 The peoples of the earliest known village-like hill communities in the Near East are called Tell Cultures. As a rule, new settlements were built on top of older ones. However, it is possible to date cultural peaks and distinctive featurcs by excavating deep shafts through the layers. 8 Coital Huyuk in Anatolia proved to be a particularly rich site for excavation. Many settlements were enclosed by protective stone walls, which testifies to competition between the sedentary agricultural communities and roaming nomad peoples. Often the different cultures can be distinguished by their characteristic pottery forms or ceramic decorations: The Syrian 9 ,10 Tell Halaf Culture, for example, which dominated the Mesopotamian area in the fifth and fourth millenium B.C., decorated its ceramics with axes or crosses. 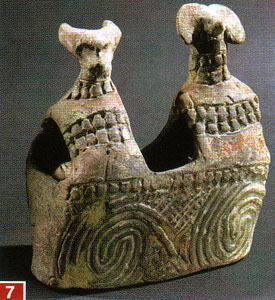 Given the importance of ceramics in determining social and cultural development, a division is made between the "Aceramic Neolithic" (ca. 8000-6500 B.C.) 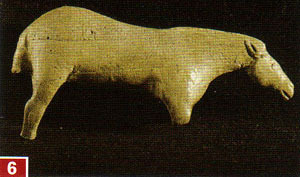 and the "Ceramic Neolithic" after about 6500 B.C. 9 Detail from altar, castle of Guzana, Tell Halaf ruins, Syria, from ca. 800 B.C. The Tell Cultures displayed varied building styles�both round and angular�and pottery forms. The discovery of 6 seals and counting markers indicates an early organization and control of economic life and trade, as well as sophisticated property-ownership relations, which paved the way for more advanced civilizations and societies. work and paths linking the communities have been found. The transition to the metropolitan civilizations of Mesopotamia began with the emergence of urban cultures in the Uruk period around 4000 B.C. The large city-like complexes in Anatolia of the early Neolithic period are a treasure trove for archaeologists because of their size and the variety of artifacts found. The clay brick houses possess central rooms that are usually decorated with painted figures, relief figures, and bull heads on the walls. The houses are so close together that the inhabitants had to enter them through a hole in the roof. Clay platforms are found along the walls under which the skeletal remains of the dead were buried. It is therefore assumed that some of the rooms were used for ancestor-worship. Numerous small sculpted figures indicate the worship of two pairs of deities and sacred animals. The inhabitants used wood and stone vessels but no pottery.